In January 2012, the European Commission, following extensive consultations, published a draft Regulation. The initiative had three priorities – modernisation of the legal framework for the protection of personal data, harmonisation of the rules across the EU (proposing a single Regulation rather than a Directive that is implemented via 28 national laws) and maintaining existing levels of protection. These goals were to be underpinned by more efficient implementation measures. After three years of discussions following the first proposal being made by the European Commission (and a first reading by the European Parliament that was finalised in 2014), the Council has decided to agree on a new text (a “general approach“) that will be the object of current trilogues. 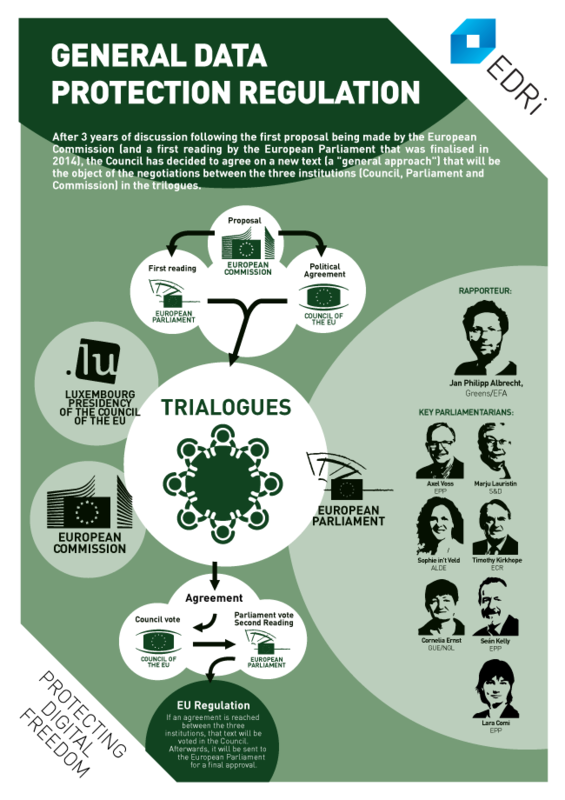 The trilogue discussions between the three institutions officially started on 24 June 2015 with the first meeting in Brussels. In order to explain the process, we will be publishing information and analysis in this document pool. We will update this post as the negotiations advance. If you would like to know more about specific parts of the Regulation, please go to EDRi’s detailed analysis on the original proposal made by the Commission at ProtectMyData.eu. For more analysis and campaign materials go to the EDRi data protection archive. 03.03.2015: EDRi press release on the leaked documents from the Council and our Broken Badly analysis of the texts. 26.06.2015: Document to be discussed in the trilogue meeting next 14 July. Analysis by EDRi of Chapter V.
Analysis by EDRi, Access, Privacy International, fipr, Panoptykon and Bits of Freedom on Chapters II, III and IV. Final texts of the Regulation and the Directive passed in LIBE (click on the “consolidated texts”) and Press Release from EDRi and its members/observers on the outcome.